Home | Site Index | Email Me! 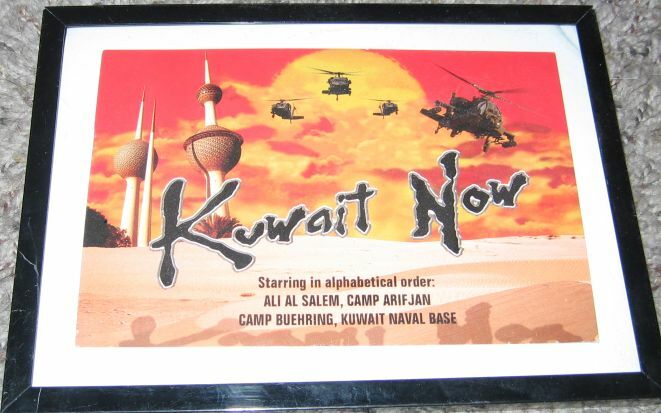 "Kuwait Now" postcard (like a movie poster), "Starring in alphabetical order: Ali Al Salem, Camp Arifjan, Camp Buehring, Kuwait Naval Base." Sent to us April 2017 by Major Mike Eubanks, SPMAGTF, stationed in Kuwait. He commented on the card that the Marines in their shop would have to "double their workouts next week" to work off the extra snacks and foodstuffs we sent. He is in the same group as MSGT Moore who sent us Flag #6.